Senior Pastor…Why Aren’t You Singing? We depend on you as a primary worship leader for our congregation. We agree that your leadership centers more on worship through the Word and Table than through the music. And we understand and affirm that worship can’t be contained in one expression such as music. But it is evident from Scripture that singing is a significant response to God’s revelation (Ps 63:5; Eph 5:19: Col 3:15-17). When writing about the future of Jerusalem, the minor prophet Zephaniah wrote, “The Lord your God is with you, he is mighty to save. He will take great delight in you, he will quiet you with his love, he will rejoice over you with singing” (Zeph 3:17). When the circumstances of life discourage us from verbalizing our songs, the Father surrounds us with songs of deliverance (Ps 32:7). And when we can’t find adequate words to express our love to the Father, Jesus as our worship leader sings with us (Heb 8:1-2; 2:12). So if the Father is singing over us and Jesus is singing with us, we have to ask how you can keep from singing? When you choose not to sing it causes us to wonder if you really view the musical worship elements as an appetizer before the main course or the warm-up band before the headliner. And when you study sermon notes instead of singing it gives the impression you are unprepared, reminiscent of a freshman cramming for a final exam. Pastor, we desire worship that is a continuous conversation with a variety of worship expressions instead of just stand-alone elements of music and preaching. So we long for you to teach and model active and fully engaged participatory worship instead of passively giving permission to others not to sing too. So in humility we ask that you join us in full-throated singing so that all of our voices, including yours, might unite in communal utterances of praise, thanksgiving, confession, dedication, commitment, lament and response. And when this occurs our songs will communicate vertically and horizontally in a unified voice so compelling that it can’t possibly be silenced (Ps 30:12). Now that I have your attention, leading worship is indeed a worthy calling and vocation that requires preparation, education and skills. And yes, it is a real job. But what if opportunities were no longer available for you to lead worship vocationally? What if you needed to voluntarily or were forced involuntarily to step aside from vocational worship leadership for an interim or extended period of time? Or if you’re a student preparing for vocational worship ministry, what if you don’t immediately land a position after graduation? What would or could you do in these instances to provide for your family while still responding to God’s call? Some of us have found ourselves in similar situations only to realize we are not trained or are not training to do anything else. Statistics show that 95% of churches average 350 or less in worship and that 75-80% of those churches average 150 or less. Forced terminations, unhealthy staff relationships and ageism are all unfortunate realities. Church planting movements have amplified the need for additional volunteer and part time worship leaders. And even larger, more established congregations are no longer realizing the need for full-time worship and music staff as they try to stretch their financial resources to accommodate their various generational, cultural, ethnic and multisite needs. With those statistics in mind, the present and future reality seems to indicate that the need for full-time music and worship leaders is on the decline. In other words, it appears there are and will continue to be more prepared full-time leaders than full time places for them to serve. So reality dictates that while preparing for worship leadership we should also be learning additional marketable skills. For this to occur, we must first acknowledge that a call to bivocational ministry is not a mediocre calling but is in fact a call to full-time ministry that just happens to occur not only when we gather at church but also when we disperse to the marketplace. We must also encourage our Christian colleges and seminaries to more actively challenge students preparing for worship ministry to also learn other vocational skills. We must agree that it is never too soon or too late to learn something new. And we must affirm that learning an additional skill doesn’t compromise our calling but in fact enhances it by allowing us to communicate in other worship languages beyond choirs and chord charts. A loss leader is when a retail chain or business offers goods or services discounted at or below cost in order to draw consumers in. The strategy is that drawing them in will hopefully then lead them to buy additional items at a higher cost. Some congregations employ this same practice of depreciating or changing their worship style as a hook to get new consumers in the door. This marketing ploy often discounts their existing worship foundations. And their unique worship DNA’s are thrown out in order to secure the loyalties of new customers. Consequently, instead of planning worship to respond to God’s revelation they start planning it to respond to cultural affirmation. And just trying anything to get them in the door will sometimes cause a congregation to hedge theologically, biblically or musically. So what will those congregations offer when consumer tastes change again and they’re too diverse or costly to accommodate? And when those new consumers are no longer new and realize that worship is going to actually require something from them, what methods will congregations initiate to keep them? How will they express deep calling unto deep worship when loss leader worship is all they’ve known (Ps 42:7)? What worship costs is more important than how it comforts us or serves our agendas. If worship is just fashioned to meet our needs and preferences, it may not be worship at all. So if you’re still trying to get them in the door with loss leader hooks such as traditional, contemporary, classic, modern, casual, or even coffee, then those hooks you are attempting to reach them with is probably all you’ll ever reach them to. Adapted from Terry W. York and C. David Bolin, The Voice of Our Congregation: Seeking and Celebrating God’s Song for Us (Nashville: Abingdon, 2005), 112. You’ll never convince your congregation to live in community as long as the two of you continue to live in isolation. If Jesus as your model for ministry called those with whom he served his friends, then shouldn’t you be doing the same? It might seem like you’re high functioning now by depending on your own strengths and gifts alone. But even when you realize some success alone there will come a time when you will fail, also alone. So maybe it’s time to figure out what’s contributing to your conflict. Maybe it’s time to admit all your strife didn’t originate in someone else’s office. Maybe it’s time to spend as much time on your relationship as you’ve been spending on ministry job placement sites. And maybe it’s time to stop expecting the people in the pews to be unified when the people on the platform aren’t. Maybe you are in conflict because you’re always willing to pastor the members of your congregation, but not each other. None of us are immune from the struggles of life such as depression, physical or mental health issues, marital conflict, errant children or financial stress. So if the two of you aren’t willing to pastor each other when you’re facing similar issues, who will? And pastoring each other will help protect you both from your own stupidity. Maybe you are in conflict because you don’t love or really even like each other that much. Scripture reminds us to love God first, then our neighbors as ourselves. Your closest neighbor beyond your family should be those with whom you serve in ministry. So what might occur if you learned to love each other more than you loved getting your own way? Maybe you are in conflict because you aren’t praying for each other. Praying that God will call one of you to another ministry is not praying for each other, it’s selfishly praying for yourself. Praying for each other requires communication, vulnerability and trust. Interceding for each other may not change your ministry colleague but it can sure change you. Maybe you are in conflict because you never share ministry together. Just because your ministry position allows you to have the last word doesn’t mean it has to be your word. Shared ministry publicly and privately affirms the calling of each other. Sharing means you are no longer guarded or territorial since you’ll both get the credit and blame. The result is that successes are maximized and failures minimized. Maybe you are in conflict because you never play together. You encourage your congregants to develop communal relationships of fellowship and fun, yet the two of you won’t even grab coffee or play golf together. In the Acts 2 church they spent time together, had things in common, broke bread in their homes and ate together with glad and sincere hearts. Those relationships are often foreign to the two of you. And finally, just maybe once you’ve worked through some of these conflicts you’ll realize it’t true that two are better than one, because you’ll have a better return on your labor. And you’ll also realize that if you fall, someone will be beside you to help you up (Eccl 4:9-10). Most of us don’t begin a new ministry position believing we’ll only stay for a couple of years. We have noble intentions to plant our lives for the long haul. But after we’ve exhausted our two-year recipe of ideas we often get bored, our leadership gets stale, our congregation gets restless and we get busy looking for another ministry somewhere else. If you are itching for another position just because it’s bigger or better, more prestigious or prominent, then your motivation might be ego instead of calling. If greener grass or rungs up the ladder is the new you are running to, you’ll inevitably be disappointed again after a couple of years and so will they. Another place of ministry may seem more convenient, appealing, challenging, fulfilling and rewarding. But until God releases you to go there, he expects you to stay here. His calling is a personal invitation to carry out a unique and sometimes difficult task. And it’s a strong inner impulse prompted by conviction, not convenience. God never promised we’d always be happy, revered, loved, appreciated or followed. He did, however, promise he wouldn’t leave or forsake us. So instead of focusing on ministry job placement sites, we should keep our eyes fixed on Jesus. It’s a discipline that is not always easy but it produces a harvest of righteousness when we are trained by it (Heb 12:2,11). According to those who have counted, one another appears in the New Testament 59 times. So if it’s that important scripturally, shouldn’t it be that important relationally as we plan, implement and sometimes need to change our church policies and practices? A theological foundation of continuous worship, therefore, must be found in the understanding that if God continually outpours and we are created in his image, then we too should be continual outpourers. But since our outpouring is fallen it needs redeeming or it will outpour on false gods. So salvation is the only way continuous biblical worship is possible. So with that theological foundation to frame our understanding of worship that doesn’t stop and start, consider the following Harold Best quotes from Unceasing Worship. Harold Best, Unceasing Worship: Biblical Perspectives on Worship and the Arts (Downers Grove: InterVarsity, 2003), 9. How you planned and led with them or your next place of ministry in mind? Segregated Worship: Not Our Kind of People? Martin Luther King, Jr. famously said, “11:00 a.m. on Sunday morning is the most segregated hour in this nation.” Well not much has changed since his original statement over 50 years ago. Most congregations welcome those who don’t look like them. All are welcome if or when they come. But they are still segregated because they’ve never made adjustments in order to be intentionally welcoming to those who don’t look like them. They might even imagine how great it would be if their church was filled with people of all colors, nationalities, economic levels, generations and even political ideologies. The impasse in this scenario, however, is that they imagine how great this could be as long as they are willing to worship the same way we do. Why are we so accepting and accommodating of racial and cultural diversities when we do missions around the world but not across the aisle? Welcoming worship means we are willing to adjust culturally, contextually and systematically not only there but also here. Welcoming worship is not just what we do when we gather on Sunday, it’s also who we are and how we treat others on Monday. Welcoming intentionally considers those who are often neglected and easily ignored. Welcoming worship agrees that, “He who oppresses the poor shows contempt for their Maker, but whoever is kind to the needy honors God” (Prov. 14:31). Welcoming agrees that those who don’t look like us didn’t get less of the image of God. So welcoming worship loves, honors and praises the Father by loving all of those He loves. Could worship be any more profound? then why are we so segregated when we worship on earth? Worship might actually occur without you. Your substitute leader might do too good of a job. The last word won’t be yours. You’ll have to encourage and empower others to lead. Church members won’t see your car parked at the church at all hours. No one else can hold the musicians and tech team accountable. Your identity will be shaped by your family instead of your work. You might actually get some rest and renewal for a new season of ministry. You won’t have an excuse for not reading and learning something new. People at your vacation destination probably won’t recognize or revere you. Most worship leaders just ended another year of busyness that culminated in a flurry of seasonal rehearsals, presentations and extra services. And since worship ministry often sanctifies busyness rather than freeing us from it, the end of one hectic season probably led immediately to another. So some of us are probably wondering if we have enough left in the tank to do it all again in 2018. But Jesus said, “Are you tired? Worn out? Burned out on religion? Come to me. Get away with me and you’ll recover your life. I’ll show you how to take a real rest. Walk with me and work with me – watch how I do it. Learn the unforced rhythms of grace. I won’t lay anything heavy or ill-fitting on you. Keep company with me and you’ll learn to live freely and lightly” (Matt 11:28-30, The Message). So instead of planning to work your days off and shorten your vacations, maybe it’s time to schedule and guard those 2018 away days now. Your church will survive and thrive if you take that time off, but you and your family might not if you don’t. Scheduling margins of recovery won’t endanger your worship ministry it will extend it. Facing Worship Leader Ageism…Stick the Landing! A gymnastic competition can be won or lost in the landing. So even if you flip, vault, tuck and twist well during the routine, it isn’t considered a success unless you can also stick the landing. Halftime is over and some of us are even well into the last quarter of our worship-leading career. We’ve accumulated decades of knowledge, experience and practical application so we know how to work smarter. But just working smarter doesn’t seem to be helping some of us finish well. So how can we stay viable, battle ageism and keep from coasting in order to stick the landing? Force Quit – Computer programs are sometimes slow or can even freeze up and become unresponsive. Selecting Force Quit reboots and reinstates the original well functioning settings. Quitting doesn’t mean we stop doing worship ministry or have to leave our present position. It just means recalibrating for a fresh start where we are now. Study a foreign language – Famed basketball coach John Wooden stated, “It’s what you learn after you know it all that counts.” So even though we might be fluent in previous worship languages, we also need to learn the musical and technological vernacular of modern worship and what might follow it. Get another job – Agreeing that worship leader ageism is unjust or theologically suspect doesn’t change its reality. So we can choose to live in a constant state of fear in the second half or we can proactively prepare in case ageism does occur. Learning additional marketable skills doesn’t compromise our calling, it actually enhances that calling beyond choirs and chord charts. And retooling could allow us to extend our shelf life and stick the landing where we are now or where God might call us next. Senior pastors sometimes adhere to the adage that familiarity breeds contempt when it comes to their relationship with their worship leader. Some of those myopic perspectives were taught by and learned from well-meaning ministry preparation professors and mentors. But if Jesus is our model for ministry and he called the disciples with whom he ministered his friends, then why shouldn’t pastors do the same. John Maxwell has concluded that over 70% of pastors have no close friends at all. So how can they possibly model for their church what it means to live in community when they are personally living in isolation? Part of Jesus’ Great Commandment is to love our neighbors as ourselves. Beyond our families we should have no closer neighbors than those with whom we partner in ministry. Those concerns with losing respect and maybe even control have created a working relationship that is often professional but not very personal. But Jesus’ close friendships didn’t keep him from exercising instruction or discipline when necessary. Peter overstepped his bounds and Jesus corrected him. And Jesus rebuked James and John when they wanted to call down fire to destroy an entire village. So having to exercise authority when necessary didn’t seem to jeopardize the intimacy of their relationships. Anecdotally, it appears that relational divides are one of the main reasons for short-tenured senior pastor and worship leader partnerships. So how can we expect the worship of our church to be healthy when the relationship of the two primary worship leaders isn’t? And those relationships will never be healthy as long as being right is more important than being right with each other. Most worship leaders long for a culture of transparent communication with their pastor built on trust that isn’t guarded, territorial or defensive. They crave a close friendship and ministry partnership but don’t often realize the job security to initiate it. So consequently, it will probably never occur unless and until the senior pastor initiates it. The worship in some of our churches will never measure up because of what we are trying every Sunday to measure up to. To measure up means to be as good as, to have the same qualifications as, to reach a certain standard as, to be of high enough quality for or to compare with something or someone else. Instead of keeping our eyes fixed on Jesus, the source and perfecter of our faith, we often focus on how we compare to other worship ministries we consider successful. So we imitate their worship habits, methods, styles, song selections and even attire in an effort to measure up to a perceived standard of success. Most of our attempts to replicate, however, forget that every church should be developing distinctly and becoming uniquely the congregation God has called them to be where they are and with what they have. Trying to measure up to the worship of another congregation every week can be like running on a treadmill. As long as we keep our eyes focused ahead we can log miles safely. But when we look to the left or right, our feet usually follow our eyes and cause us to fall. Comparing ourselves to others means we are trying to measure up to a standard God has called them to, not the one He has called us to. And He obviously sees the value of our calling even when we don’t. So keeping our eyes on Jesus instead of others means we lead worship with contentment, not comparison. It’s a discipline that is not always easy but it produces a harvest of righteousness when we are trained by it (Heb 12:11). Is Music Killing Your Worship? Most worship leaders have some level of formal or informal musical training. Consequently, music is usually their default when it comes to worship planning. So even though they know worship and music aren’t exclusively synonymous, they usually begin their worship preparation each week with the songs. Music is indeed a valued expression given to us so that we might offer it to God in worship. But it isn’t the only or even primary worship expression. In fact, music is a supplemental not foundational worship element. Worship can’t occur without hearing from God through His Word and communicating with Him in prayer. So until we get those worship foundations covered first, then music is just music. We defend the Bible as foundational to our theology and practice, yet rarely read its text in our public services of worship. Doesn’t its limited use convey a lack of trust in the very Word from which our music must spring forth? Our songs will have new life when worship begins with the Word. Prayer has been relegated to the role of a worship service utility infielder. It is often plugged into our worship service holes as a connector rather than a stand-alone divine conversation that actually gives us a reason to sing in the first place. Some of our church cultures limit the Lord’s Supper as a foundational worship element, believing its frequency can encourage monotony. But maybe in our infrequency we are missing two worship actions and interactions only available at the Table: the vertical Communion with Christ through partaking of the elements; and the horizontal Communion of believers unified in identity and relationships at the Table. As we plan, prepare and lead worship we must freely and strongly say, “There is more, far more.” Be hungry. Be thirsty. Be curious. Be unsatisfied. Go deep. And when we do, those foundational elements will alleviate the pressure on music as the primary driver of worship renewal and diminish its blame for worship demise. Adapted from Harold M. Best, “Authentic Worship and Artistic Action,” an address to the Calvin Institute of Worship, 2005. Can you imagine a baseball announcer encouraging the fans to greet one-another after singing “Take Me Out to the Ballgame?” Or can you visualize the orchestra concertmaster asking you to find someone you don’t know to shake hands with after the second movement of a Mahler Symphony? How about asking worshipers to shake hands after the opening song at church? The worship service Meet and Greet can cause anxiety sweats and heart palpitations for first time guests and congregational introverts. Some see that service element as shallow, contrived and intimidating. So have you ever wondered if it’s actually serving its purpose? What do you think most people are really thinking during this service ritual? These ten awkward handshakes might just give it away. What he might be thinking: We’re getting ready to sing a Tomlin song in its original key. What he might be thinking: I should’ve gotten the solo on the opening song. What she might be thinking: I got the solo on the opening song. What he might be thinking: I’d rather be golfing so I’m saving my grip for 18 holes after the service. What he might be thinking: Maybe I can get him to serve on the building and grounds committee. What she might be thinking: Don’t ask me to serve on anything. What he might be thinking: I haven’t forgotten about your hard slide in the softball game yesterday. What she might be thinking: A non-verbal “bless your heart,” meaning I know your sins better than you do. What he might be thinking: I still have Larry Norman and Stryper in my play list. What he might be thinking: I didn’t see a lot of hand washing at the pre-service restroom meet and greet. You may have read or heard stories of expeditions to the summit of Mount Everest, the highest peak in the world. If so, you’ll recognize the names of Sir Edmund Hillary or George Mallory. Because of their Everest ascents, these men have been recorded as some of the greatest climbers in history. But the names of Tenzing Norgay, Temba Tsheri, Pemba Dorje or Lhakpa Gelu are probably unrecognizable to most of us outside the Everest climbing community. These men and others like them have in fact made the most and fastest ascents at the youngest ages. Hundreds of climbers attempt to reach the summit of Everest every year with the help of guides from the ethnic group of people known as Sherpas from the mountains of Nepal in central Asia. Sherpas prepare the route, fix the safety ropes, carry the supplies, set up the camps and then help the climbers attempt to reach their goal of conquering Everest. Without the assistance of the Sherpas most climbers would probably fail to reach the summit. The Sherpas are so successful because they understand the mountain themselves before attempting to assist others. They are local people who know the mountain, know the culture, know the people and consequently, know the potentials and limitations. These Sherpas are the most skilled mountain climbers in the world but their names aren’t often known because their job isn’t about the notoriety of their own success, it is about helping others succeed. As worship leaders, we have the sacrificial and not always noticed responsibility to help others with less skill, less training and often less knowledge. Some of them will be experienced, some won’t. And some of them will have been hurt in previous climbs and will be trying to find the courage to climb again. So like Sherpas, our worship leading success will not be evaluated just on how well we reached the summit ourselves, but how we assisted others to reach the summit too. When Theodore Roosevelt coined the term “bully pulpit,” he observed that his position of influence as president gave him a unique platform from which to persuade, exhort, instruct and inspire. Roosevelt famously used the word bully as an adjective meaning great, superb, excellent or wonderful. As a pastor, you have been given a similar position of influence from which to speak out, advocate and encourage. Your unique bully pulpit gives you a platform for persuasion, exhortation, instruction and inspiration. It is dangerous, however, if you choose to invert that bully pulpit from a place of influence to a position of control. Transposing from advocacy to autocracy will degrade your platform from a bully pulpit to the platform of a pulpit bully. There is no virtue in bullying disguised as righteous indignation. So pastor, if you give in to that temptation you’ll believe all problems originate in someone else’s office. You’ll reject cooperation, compromise and kindness in order to guard territory and filter information. You’ll outgrow the need to learn anything new. You won’t share ministry because accountability will threaten your position of authority. And collaboration will always be suspect because you’ll view those with different perspectives as insubordinate. Once you adopt an attitude of entitlement and invulnerability you may achieve compliance from others but rarely buy-in. So even those within your so-called inner circle will submit to your leadership out of fear not friendship, out of caution not loyalty, out of submission not conviction. As a result, your position will also be one of profound loneliness. So pastor, is being a pulpit bully really what God intended when he called some to be apostles, some to be prophets and some to be evangelists? Maybe giving in to that temptation is just the fear of losing control of something that was not yours to begin with. So it’s still not too late to realize that the final word doesn’t always have to be yours. There’s time to pray and plan together with others as partners instead of pawns. It’s never too late to pastor with an attitude of mutuality with no ulterior motive. And when you do, your church and staff relationships will never be the same. Christianity Today recently published an article indicating that nearly one-fourth of all active ministers have been forced out at some point in their ministry. These termination statistics remind us that the choice to stay is not always ours to make. But what if we are or aren’t doing some things that are contributing to an early ministry departure? Aren’t we called to do everything we can possibly do here instead of just hoping it will be different when we move there? Relational instead of musical deficiencies seem to be at the root of many forced worship leader terminations. And yet, most worship leaders spend the majority of their time just trying to improve themselves musically. The reality is we can never learn and teach enough new songs to make up for relationship and leadership failures. So it’s time to quit doing or not doing those things that might be contributing to your discontent or the discontent of those to whom you are accountable. Coming in late and leaving early. Blaming others when you drop the ball. Using artistry as an excuse for laziness. Depending on music alone to fix relationships. Assuming all problems began somewhere else. Trying to pastor from the platform alone. Looking for shortcuts or excuses and pay the rent. Coasting at the beginning of the week and scrambling at the end. Coming to rehearsals and meetings unprepared. Trying to make changes without seeking buy-in. Expecting others to change first. Viewing relationships as artistic interruptions. Holding volunteers to a bar you aren’t trying to reach. If you’re familiar with cheerleading, then you understand its purpose is to generate spirit. It is scripted, coached, practiced and performed in order to rally enthusiasm, create energy and spawn excitement. Cheerleading includes a variety of synchronized routines such as songs, dances, chants and stunts. The cheerleaders implement these various actions with 3-4 minute routines to work-up or generate the spirit of the spectators. Some cheerleaders even admit their exuberance isn’t necessarily something they actually feel but instead something they put on, much like their facial makeup. 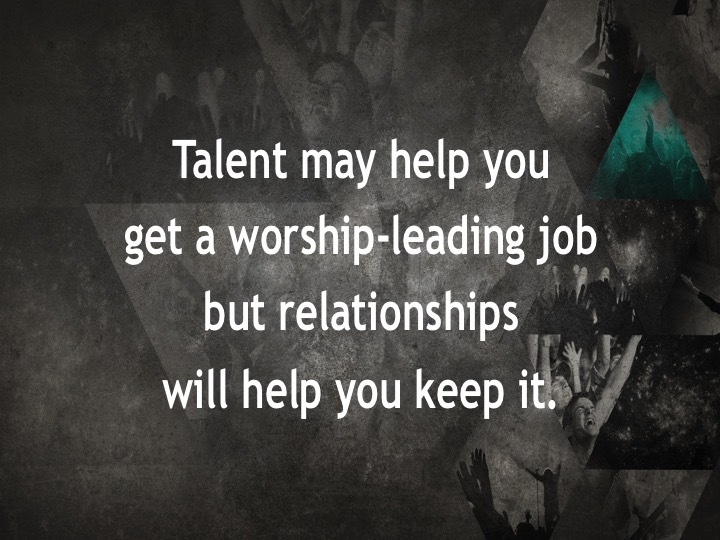 To motivate their congregation, worship leaders can sometimes display similar cheerleading traits. But…Worship leaders are not cheerleaders. Worship leaders can’t generate the Spirit of God through their synchronized actions and song selections. Those actions might prompt, exhort, encourage or even prod more response to the Spirit but they can’t create it. He has called us out of darkness into His marvelous light that we may declare His praises (1 Peter 2:9). The Father is seeking the kind of worshipers who worship in spirit and truth (John 4:23). We are responders to God’s calling and seeking, not originators of it. So as good as our various worship routines might be, they will never work-up enough enthusiasm, energy and emotion to create a Spirit that can only be recognized and responded to. We can acknowledge the Spirit but we can’t generate it. We can respond to the Spirit but we can’t initiate it. We can celebrate the Spirit but we can’t create it. Some worship leaders don’t consider evaluating their worship services until they receive complaints about something they are or aren’t doing or singing. Consequently, their responses are usually defensive rather than evaluative. A preemptive strike is an action that is intentionally initiated to keep another inevitable action from occurring. It is preventive and proactive in order to deter a more unfavorable action or attack from transpiring. Evaluation is already occurring in the halls and parking lots. So why wouldn’t we want to preempt those conversations with a process that encourages worship renewal instead of just as a response to worship conflict? Evaluating worship from the inside is an internal process of enlisting individuals and groups from within your congregation to regularly evaluate present worship structures and practices. Inside or internal evaluators already understand the culture, doctrines and personnel assets or liabilities that frame your worship preparation and implementation. So they have a vested interest in the process and results since it too is their church. One area of caution, though, is since the evaluators have a more personal interest there is sometimes the danger of ideological evaluation. Those evaluations can be based on likes, dislikes and styles instead of biblical and theological content. But the benefits definitely outweigh the risk of encountering the occasional ideologue. Develop an evaluative team for worship planning and follow-up evaluation. Include musicians, theologians, technicians, artists, etc. Video the platform personnel (including the pastor) as an evaluative tool for the team. Look for: genuineness, preparedness, idiosyncrasies, platform presence, vocal clarity, language clarity, etc. Video the congregation before, during and after worship services to evaluate how or if they are participating. Enlist multi-generational and multi-ethnic congregants to respond to questions regarding the relevance of worship to their generation or culture. Ask evaluation team members to sit in various places during worship services to consider volume, balance, pace, flow, content, congregational participation, etc. Enlist non-musicians to respond to musical questions. Ask an educator to evaluate language and grammar usage of platform leaders. Encourage non-technical congregants to respond to projection, sound, lighting and other technical/logistical questions. Implement platform personnel peer-to-peer evaluations. Keep it simple. Don’t attempt to evaluate too much at a time. Design evaluations to minimize the focus on style and personal preferences. Avoid “I like” or “I don’t like” questions. Ensure evaluations aren’t used to manipulate or provide justification for biases. Evaluate strengths as well as weaknesses. Most potential homebuyers decide if they will check out the interior of a house or take it seriously as a home prospect based on its curb appeal…how it looks from the street. Statistics show that a positive curb appeal brings more people through the front door and gives them a healthy first impression. Conversely, poor curb appeal excludes certain people from looking further and those who actually do look will automatically discount its value. There is value in healthy religiopolitical debates as long as those dialogues begin with biblical theology instead of political ideology. If, however, we continue to start with politics, then our curb appeal will depreciate even more and cause culture to drive on by in 2017 and beyond. We united around what we were against rather than what we were for. Formerly inclusive guardrails became exclusive litmus tests. We blurred the lines between commandments and amendments. We claimed theologically and philosophically to be racially diverse, yet still segregated relationally and practically. We no longer encouraged or even allowed critical thinking. Friendly fire contributed to our net loss. We hated the practices of culture more than we loved the people in it. We justified meanness in the name of guarding religious territory. Fartlek is not a middle school bodily function joke. It is an actual running term of Swedish origin that literally means “speed play.” Running fartleks involves varying the pace throughout your run, alternating between sprints and slow jogs. Unlike traditional interval training that involves specific timed or measured segments, fartleks are intentionally unstructured. Adding them to your training plan is a fun way to give new life to monotonous distance runs as well as rigorous speed intervals. Fartleks offer a runner the opportunity to experiment with various paces, ultimately increasing your speed and stamina. Most worship leaders just ended another year of busyness that culminated in a flurry of seasonal rehearsals, presentations and extra services. And since ministry often sanctifies busyness instead of freeing us from it, we probably ended this hectic worship season by immediately starting another one. So some of us are undoubtedly wondering if we have enough left in the tank to do it all again. The question we need to ask as we begin 2017 is, “am I ready to run a healthy race that also includes margins of recovery between those seasons of going all-out? Jesus said, “Are you tired? Worn out? Burned out on religion? Come to me. Get away with me and you’ll recover your life. I’ll show you how to take a real rest. Walk with me and work with me – watch how I do it. Learn the unforced rhythms of grace. I won’t lay anything heavy or ill-fitting on you. Keep company with me and you’ll learn to live freely and lightly” (Matt 11:28-30, The Message). So if your 2016 worship leadership seemed joyless and you were constantly frustrated when those you led seemed to lag behind, then maybe it’s time to lighten up. Add some speed play to your rigorous schedule so you and those you lead can again experience the joy of worship leadership and have enough endurance to still be in the race at the end of 2017. Most worship leaders hunger for the investment of and healthy communication with their senior pastor. But they don’t always have the freedom to initiate that relationship or those conversations until the senior pastor starts them. Consequently, planning, preparation and evaluation is often by trial and error that can be discouraging to the worship leader and frustrating to the senior pastor. Worship leaders crave the attention of a senior pastor who values and creates a culture of healthy communication, sacrifice and trust that isn’t guarded, territorial, defensive or competitive. In other words, worship leaders long for the relational bond of shared ministry with a senior pastor who is confident enough in his own abilities and limitations to humbly admit publicly and privately that he can’t get it done alone. A collaborative spirit that is complementary, not competitive. Grace that welcomes disagreement without fear of retaliation. Respect for the calling and leadership of others even when radically different from their own. The capacity to affirm in public; correct and coach in private; and pastor in both places. Enough humility to acknowledge that shared ministry doesn’t threaten but instead strengthens. A desire to initiate significant conversations about vision, dreams, expectations and evaluations. A yearning to invest in the personal and spiritual development of others with no ulterior motive. The confidence to acknowledge the sermon may not always be primary. The resolve to work toward a common philosophy of worship. A prayer intercessor for and with ministry colleagues. An appropriate sense of humor. Full engagement in worship, spiritual disciplines and family. In a few decades you are going to look back at your years of worship ministry with a desire for a second chance to handle some things differently. You will think about certain services, special events, entire seasons of ministry or strained relationships and long for another opportunity to make some adjustments. The reality is that it will be impossible for you to go back and make corrections to most of those situations. But with a little humility, resilience and resolve now, you have an opportunity to get some of them right the first time. So here are a few things you are going to learn. Surround yourself with people who will stretch your thinking and actions but also hold you accountable. Taking necessary risks might cause you to make some mistakes but the discernment of others will help protect you from your own stupidity. It might be exhilarating when you succeed alone but it won’t be when you fail alone. And you will sometimes fail. People will always remember how you treat them when you’re off the platform more than how you lead them on the platform so know more people’s names than new songs. Consider their interruptions as divine appointments instead of distractions. Drink more coffee with senior adults and ask their opinions before initiating change. Be more patient with needy people and chronic takers. And remember to thank those who make sacrifices to invest in you, your family and your ministry. Be on the front end of learning newer musical and technological languages. But don’t assume it’s always appropriate to be an early adopter of them. Being conversant in a language doesn’t mean it should be used when it doesn’t fit the voice of your congregation. Learn more theology than musicology and practice leadership development more than you practice your guitar. Always ask how something might impact your family before asking how it might impact your worship leading. Leave more things at the office when you go home and be home when you are home. Taking a Sabbath each week will not only help your spiritual and physical health, it will also help the relational health of your family. Stay longer instead of bailing for a new place of ministry every couple of years. If your ministry frequently moves your children away from their friends and foundations, then how can you expect them to even like church when they are no longer required to attend? What you know about worship leading now won’t be enough to sustain you through your entire ministry. So read more, study more and ask more questions. Be a lifelong learner who understands it’s never too soon or too late to learn something new. Finally, I know it is sometimes overwhelming to balance the stresses of ministry and family. So when leading worship is discouraging; when it seems like no generation is ever completely happy; when you can’t sing too many or too few hymns; and when you wake up on Monday morning and wonder if this is really worth it; you can rest assured that you’ll also be able to look back at those decades of ministry and acknowledge with certainty that it was. Worship is something we do, not something done for us. The conviction that a priest must mediate to God for us was set aside through the doctrine of the priesthood of every believer. But even if most evangelical church worshipers theologically embrace that doctrine, they often function practically as if they don’t. When worship leaders act as priestly worship gatekeepers, they can hold a congregation captive to style, tradition, form and structure. They have a tendency to direct, regulate, contain, moderate and restrain. The result is worship determined hierarchically and disseminated corporately, meaning it can only really occur in a controlled setting that they lead. Abdicating our individual worship responsibilities continues when only a select few are encouraged or even allowed to read, speak, pray, testify, lead, sing, exhort, offer communion, baptize, lament, confess, bless, praise and thank. There is no question that worship leaders are called and we often need them to facilitate, prompt, remind, exhort, prod and encourage us to a deeper worship understanding. But they are not called to mediate for us. Do It Yourself Worship, on the other hand, relies on the collective cooperation from all to plan, prepare and implement the worship systems of a congregation. DIY Worship sets congregants free. The gate is always open. It helps them realize that worship can’t be contained in one location, context, culture, style, artistic expression or vehicle of communication. Even though it can be messy, DIY Worship is freeing in that it reminds us all that worship is not just something we do on Sunday but also who we are during the week. The author of the book of Hebrews points out that the old covenant limited access to God. Only the high priest was allowed into the Holy of Holies one time a year with a blood offering (Hebrews 9:3, 6-7). So the place where God’s presence was most revealed was not available except through the high priest and only at certain times. But in the new covenant in which we live, Jesus became the mediator serving as the intercessor for the people of God. An earthly priest was no longer required; the sacrifice was complete; Jesus’ blood was offered; the veil was torn in half; and the way was now open for all to worship Him without an earthly mediator. We will never completely understand worship as something we can do ourselves, instead of something that must be done for us until we embrace with confidence our individual worship freedom to “enter the Most Holy Place by the blood of Jesus” (Hebrews 10:19). Trying to fix worship by randomly changing the songs is like a physician arbitrarily treating an illness before a diagnosis. 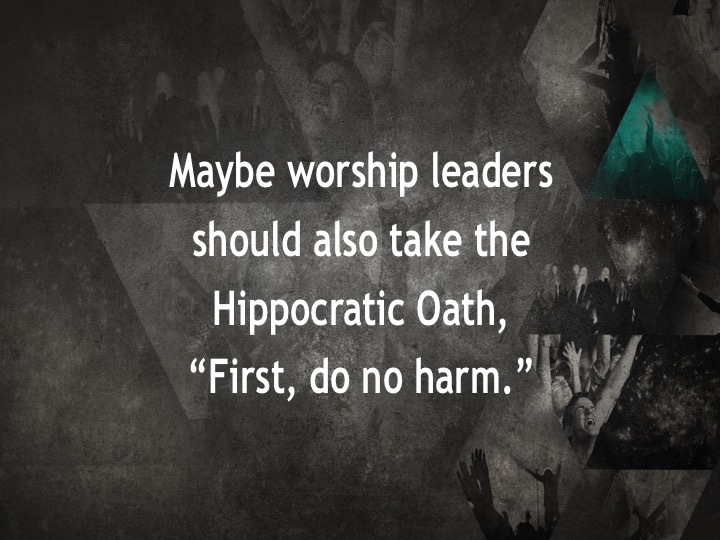 Worship health and consequently its renewal will only occur by evaluating our worship principles first before we ever consider changing our worship practices. Diagnosis is the process of determining by examination and evaluation the nature and circumstances of a diseased condition. Treatment is the administration and application of remedies once the diagnosis has been determined. We seem to continually invert these two processes. So instead of evaluating our worship health based on biblical foundations, theological tenets and historical precedents, we often attempt to heal it through song selections, stylistic adjustments and personnel firings or hirings. Intentional evaluation before indiscriminate implementation can provide a constructive process for a congregation to verbalize foundational worship principles. Once those deeper biblical and theological principles are solidified they can then set treatment goals for their worship practices in response to the actual diagnoses. Trial and error treatment focused on style and service mechanics will continue to consume the energy of worship planners and leaders unless an organized diagnostic plan is put in place. The end result is often exacerbated worship unhealthiness that is much more contagious. But if instead we ensure that our diagnosis always precedes the treatment, our worship renewal prognosis can’t help but be more hopeful. A worship service without the reading of Scripture may not be worship at all. Why do churches that so passionately defend the Bible rarely read its text in public worship services? Does its limited use convey a lack of trust in the very Word professed to be foundational to our faith, doctrines and practices? And by limiting its text to a single reading prior to the pastoral exhortation are we implying that a higher level of credibility is found in the exhortation than in the Word itself? If Scripture can’t stand on its own, then we can’t possibly prop it up with our own superficial words. Congregations continue to struggle in their understanding of spirit and truth worship by maximizing music and depending on it alone to encourage worship renewal. At the same time those congregations often minimize the very foundational text from which our songs must spring forth. The dialogue of worship is formed when God’s Word is revealed. This revelation causes worshipers to respond through the prompting of the Holy Spirit (I Cor 2:12-15; I Thess 1:5). The result is a vertical conversation with God and horizontal communion with others. This dialogue develops a community that congregations have been desperately trying to create through their songs alone. Scripture must be foundational to our songs, sermons, prayers, verbal transitions and even announcements. It must be frequently and variously read and allowed to stand on its own. And when the biblical text organically yields our sermons and songs rather than serving as fertilizer for our own contrived language, we will leave in here worship with the text in our hearts and on our lips for continuous worship out there. Robert E. Webber, Ancient-Future Worship: Proclaiming and Enacting God’s Narrative (Grand Rapids: Baker, 2008), 113. John M. Frame, Worship in Spirit and Truth: A Refreshing Study of the Principles and Practice of Biblical Worship (Phillipsburg: Presbyterian and Reformed, 1996), 90. John Burgess, Why Scripture Matters: Reading the Bible in a Time of Church Conflict (Louisville: Westminster/John Knox, 1998), 41; as quoted in Leanne Van Dyk, ed., A More Profound Alleluia: Theology and Worship in Harmony (Grand Rapids: William B. Eerdmans, 2005), 66. 1. God hates the same styles of worship we hate. 2. Inspiration begins and ends with one music genre. 3. What we deserve and have earned are worship planning yardsticks. 4. 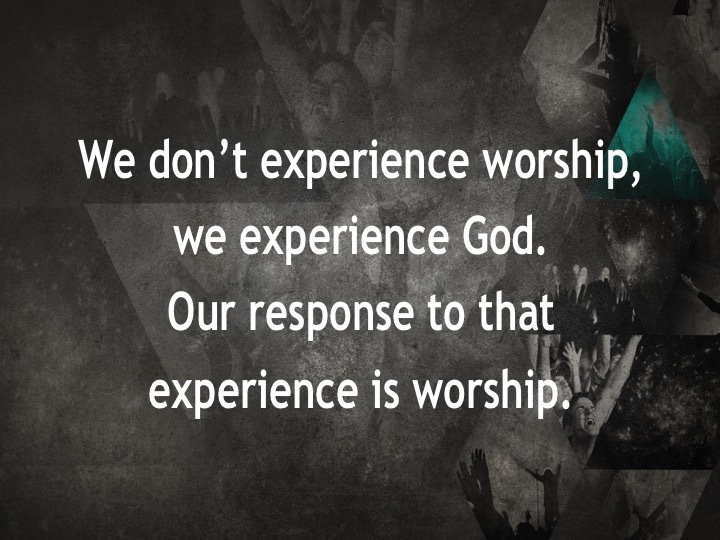 We can plan, control and explain everything that happens in worship. 5. Our worship always requires someone else’s sacrifice. 6. What we sing or how we sing it determines God’s presence. 7. Worship is planned to perpetuate past feelings or promote future ones. 8. Musicology instead of theology is our starting point. 9. Preparation and presentation centers on the creative instead of the creator. 10. Worship starts and stops with our opening and closing songs. If some of our music is “special” does that mean the rest is just ordinary? Is “older white guy” a biblical qualification for serving as an Usher? Shouldn’t we have tested those white baptismal garments in water before determining they inspire thoughts of purity? Why aren’t we still singing the Charles Wesley hymn text, To me, to all, Thy bowels move? Can a worship leader wear a man-bun with a camp shirt? Is “but Jesus preached in sandals” really a valid argument for wearing flip-flops in the worship team? Does it seem like more people complain about the volume when they don’t really like the musical style? When skinny jeans are no longer in style will worship leaders be able to lead songs in lower keys? Buyer’s Remorse is the negative emotions or feelings of regret after making a major purchase or costly decision. The buyer may have felt pressure from others to buy or buy-into a product before he/she was ready. The high price of the new often seems extravagant and is sometimes seen as inferior or unnecessary after acquiring it. In an effort to initiate worship change, leaders often rush into doing anything different than what they think is not working now. And failing to initiate worship change when change is necessary can cause a congregation to get stuck. But initiating those changes without appropriate preparation could cause congregational buyer’s remorse. Consider these 5 keys to avoid the inevitable regret of impulsive worship change. Score: A tool used by a composer, conductor or analyst that shows all the parts of an ensemble, enabling the experienced reader to “hear” what the composition will sound like. The score is the focus, outline, containment and limitations of the considered change. Even though a score has framework limitations it is still open to the interpretation of the conductor and players. Rehearsal: The practice of something to be performed, usually to test or improve the interaction between participating people, or to allow technical adjustments. Rehearsing a change is actively soliciting buy-in from congregants with unique gifts, perspectives and abilities. The pain of transition is amplified when leaders discount congregational members as uninformed, as incapable of grasping the theological implications of change or by assuming that they are so rooted in their old identity and behavior that they are unwilling to think in new ways. Rehearsing change creates an environment where individuals realize their wisdom is an essential part of what is being created. Shared vision allows a congregation to consider the various perspectives and molds them within the framework of the score. It then creates a unified ensemble ready for the final presentation. Tempo: Tempo is the relative speed at which a composition is to be played. Rehearsal gives a congregation time to set the proper tempo for change. What might appear to a leader to be the quickest and most direct route may seem reckless to those members of the congregation who have the same goals but are more comfortable taking safer or slower routes. Ignoring signals of caution can create conflict, sabotage trust, leave those we lead in our wake and cause us to re-trace our steps. What was intended to accelerate the pace may in fact lengthen it. The tempo established during rehearsal can kill a composition or it can encourage its success. Modulation: The process of moving from one key to another. The essential word in the previous definition is process. Change is a process, not a one-time event. Modulation offers a congregation a less painful transition by allowing time for them to come to terms with their identity change. Jumping from one key to another without the process of modulation is abrupt and jarring, leaving the listener stunned and frustrated. Ironically, one of the key components of a successful modulation is dissonance. Dissonance will occur in the change process and cannot be ignored or it will surface again. Resolving dissonance in the modulation process releases the tension of moving from the previous to the new. Transformation takes time and the process is just as important as the end result. Initiating worship change without planning and serious reflection often causes unnecessary buyer’s remorse. Faithful leaders, however, successfully open their congregations to new concepts by accenting what they are now doing well, by giving those congregants time to consider what they might do better and by involving them throughout the process. Andy Stanley, The Next Generation Leader (Sisters: Multnomah, 2003), 75. Peter Senge in Brad Berglund, Reinventing Sunday: Breakthrough Ideas for Transforming Worship (Valley Forge: Judson, 2001), 11. Chip Heath and Dan Heath, Switch: How to Change Things When Change Is Hard (New York: Broadway Books, 2010), 290. Stanley, The Next Generation Leader, 50. If the choice to stay in your present ministry position or leave for another one is within your control, then you should be asking some fundamental questions before considering a move. Has God released me from my call here? Another place of ministry may seem more convenient, appealing, challenging, fulfilling and rewarding. But until God releases you to go there…stay here. God didn’t promise that you’d always be happy, revered, loved, appreciated or followed. So if you are running from ministry or relational dysfunction that isn’t resolved here, what makes you think it wouldn’t follow you there? Am I running to something? If you are interested in another ministry just because it’s bigger, better, more prestigious or prominent, then your motivation might be ego instead of calling. If greener grass or several rungs up the ladder is the new you are running to, then you’ll inevitably be disappointed and so will they. How might it impact my family? Only considering your own ministry desires, needs and wants without recognizing how it might affect your family is not a calling, it is conceit. If your ministry frequently moves your children away from their friends and foundations, then how can you expect them to even like church when they are no longer required to attend? Am I ready to leave well? Christianity Today recently published an article indicating that nearly one-fourth of all active ministers have been forced out at some point in their ministry. It is true that staying in a current ministry position may not always be within our control. But what if we are or aren’t doing some things that are contributing to our positional demise? Aren’t we called to do everything we can here instead of just hoping it will be different when we move there? Relational instead of musical deficiencies seem to be at the root of many forced worship leader terminations. And yet, most worship leaders continue to spend the majority of their time just trying to get better musically. We’ll never be able to learn and teach enough new songs to make up for relationship and leadership failures. Meaningful relationships develop as we place more focus on people than projects. What will our congregants remember most…how we led them musically on the platform or how we treated them to and from the platform? Ageism often gets the blame for this one. Even though ministry ageism is theologically suspect so is not learning anything new. A lifelong learner is one who understands it is never too soon or too late to learn. What we once learned is not enough to sustain our entire ministry. What is compelling us? Convenience responds with, “This is what I like to do.” Calling responds with, “This is what I was created to do.” If we lead worship just because we love to play and sing, because we need to supplement our income, because we enjoy being up-front or because we aren’t trained to do anything else, then our compulsion might be out of convenience instead of calling. Even when we win a relationship conflict with our pastor, we lose. The relationships exemplified by the Acts 2 church as they spent time together, had everything in common, broke bread in their homes and ate together with glad and sincere hearts is often foreign to pastors and worship leaders. What could occur relationally if we resolved to buy-in to our pastor’s leadership as long as it wasn’t immoral, illegal or unethical? Scripture reminds us to love God first, then our neighbors as ourselves. Our closest neighbor is our family. We must never sacrifice family for ministry since they are our ministry. Instead, we should first ask how something might impact our family before ever asking how it might impact our job. Want Multicultural Worship? Speak Their Language! Imagine your church filled with people of all colors, nationalities, economic levels, generations and even political ideologies all worshiping God together! The problem with this scenario is that most of us imagine how great this could be as long as they worship the same way we do. Early missionaries went to other countries and attempted to teach indigenous tribes and tongues to worship by singing western songs with western notation and western rhythms only to realize that those indigenous people were not connecting with a deeper biblical and theological understanding of worship. It wasn’t until the missionaries encouraged the use of native dance, tonalities, instruments and rhythms that the various tribes and tongues were able to understand worship in spirit and truth. We often make the same mistake in our own American churches. We try to create homogenous worship without considering the various cultures and generations of those present and those not present yet. And then wonder why they aren’t grasping a deeper understanding of worship renewal. Why are we so understanding and accepting of cultural diversities around the world but not across the aisle? And why do we call it missions when we embrace cultural influences on worship internationally and call it compromise when we embrace those influences domestically? If we really want to understand and encourage multicultural worship, maybe it’s time for worship leaders to become ethnodoxologists. Ethnodoxology is the theological and anthropological understanding and application of how various cultural groups might use their unique and diverse artistic expressions appropriately to worship God. It recognizes God is present in and reveals Himself to other cultures. The term finds its source in 2 Biblical Greek words…Ethno from the Greek word ethne meaning peoples or people groups; and Doxology, from the Greek word doxos meaning glory or praise. Stop trying to fix everything with music. Music is a universal language as long as you live in my cultural universe. So when music is the solitary driver of multicultural worship it will get the solitary blame if it fails. Discover and assimilate the heart languages of those who are here and those who are not here yet. Heart language is the mother tongue in which we first learned to express our joy and sorrow. Help congregants understand worship as a life to be lived together before considering it as an event in which to participate together. Lead and model for their congregations how to live multicultural instead of monocultural lives. How can congregations expect to have multicultural worship when they segregate in everything else during the week? Learning to love, respect, understand and defer to each other outside of the worship service can’t help but positively impact multicultural worship inside the worship service. Look beyond Americanism as having a corner on worship understanding and expression. We must look at what God is doing around the world and agree that no single country or culture offers the only acceptible way to worship. Promote multicultural platforms. Being a multicultural church means more than just singing international songs. It means that the people who plan and lead worship must also represent a variety of cultural and ethnic groups. Few people will believe we desire multicultural worship until we also have multicultural leadership. Don’t undervalue diversity by assuming worship is homogenous and therefore eliminates all differences. Multicultural congregations understand that the gospel brings unity amidst our diversity, not in uniformity. If we are not meant to be segregated by our cultures and generations as we worship in Heaven, then why are we so segregated as we worship here on earth? We seem to have forgotten that, “The Father is seeking (He is initiating) the kind of worshipers who worship in spirit and truth” (John 4:23). 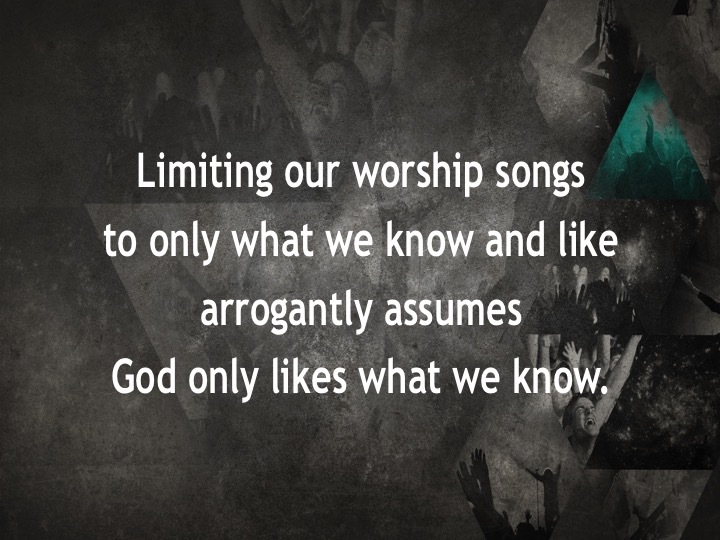 How arrogant then is it for us to assume that what we sing or don’t sing or how we sing it or don’t sing it determines if God shows up in our worship services. He has called us out of darkness into His marvelous light that we may declare His praises (1 Peter 2:9). God calls…we declare. We can acknowledge His presence but we can’t generate it. We can respond to His presence but we can’t initiate it. We can celebrate His presence but we can’t create it. We often take credit for instigating God’s presence when in reality He started the conversation, was present long before we arrived and has been waiting patiently for us to acknowledge Him. Swiss theologian Karl Barth stated that when people assemble in the house of God they are met with expectancy greater than their own. Worship doesn’t invite God’s presence…it acknowledges it. Event Spectators or Worship Participators? If we never involve our congregants as more than casual bystanders while we read, speak, sing, play, pray, testify, lead, mediate, commune, baptize, confess, thank, petition and exhort, then how can we expect them to transform from passive event spectators into active worship participators? Someone who attends or watches an event or game; An onlooker or observer; A member of an audience; A spectator could be a fan or foe depending on who is playing and what is being played; and Spectators think they are in the game because they are in the stands. Someone who is involved or makes a contribution to; Related to something larger than oneself; One who invests in, takes part in or shares in; A participator is engaged and involved; and Participators are in the game because they are always on the field. Leaders are doing everything for them. Worship is a weekly event instead of a daily life. Singing is the only participatory option given to them. Various artistic expressions aren’t encouraged or allowed. Worship space and technology encourages audience observation. Worship is a noun instead of a verb. Worship is regard for religion instead of response to revelation. Worship is man perceived instead of God conceived. Just showing up is the only preparation expected. William H. Willimon, Preaching and Leading Worship (Philadelphia PA: Westminster, 1984), 20. Some congregations evaluate the theological depth of their worship but never consider how shallow their worship service logistics are. Guests often visit our churches with little or no understanding of theological worship. They do, however, understand excellence, cleanliness, the safety of their children and their own comfort or its absence. So maybe it’s time for churches to also evaluate their worship logistics including what occurs before, during and after the service. Since it’s easy to overlook what we have gotten used to, it is more beneficial to secure an outside evaluator for a greater degree of unbiased and unprejudiced objectivity. A friend from another congregation, an acquaintance from the community or even your favorite coffee shop barista could be enlisted as a secret shopper. For the minimal expense of presenting them with a restaurant gift card you could invite one or several guests to visit and complete an evaluation questionnaire. We often assume the theological depth of our worship service will encourage visitors to return and even stay. And that might actually be true if they could ever see past our logistical blind spots.